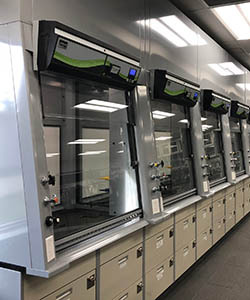 Air Master Systems Solution Series fume hoods includes three bench mounted hoods with differing applications and specialties to meet a variety of laboratory situations. The Solution Work Station (SWS), the Solution Hood, and the Green Solution Chemical Filtration Hood. Contact your local distributor for specification and ordering information. The Solution Work Station (SWS) is a bench mounted, ducted fume hood designed to allow 360 degree viewing. The 7/32″ clear, laminated safety glass side panels protects students and on-lookers while giving them a clear view of the processes inside. Also included are two tube vapor sealed, T-8 fluorescent light with bulbs to make sure your experiments are clearly illuminated for all to see. 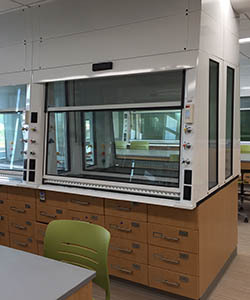 The Solution Series Solution Work Station laboratory fume hood’s design allows for back-to-back and side-by-side configurations for flexibility in designing undergraduate teaching and learning labs. It is available in varying sizes from a worktop width of 48″ with a hood opening of 37.5″ to a full 72″ worktop with a hood opening width of 61.5″. Since the point of a fume hood is to keep people safe, we install front-loaded valves with plumbing outlets within arms’ reach, while your head is outside of the sash. 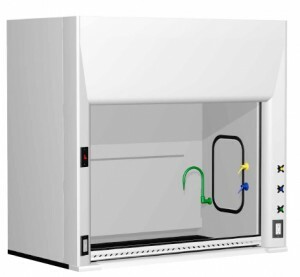 The Solution Ducted Hood is a functional and stylish fume hood designed to fit a multitude of laboratory applications. The streamlines posts and radiuses airfoil, along with a 36-inch high viewing area offers a softer look than conventional fume hoods. This hood is applicable in both CAV and VAV designs. All hoods are commissioned by our factory personnel and all our fume hoods are certified with a Valiquest Payback. This certification by our lab assures researcher safety as well as economic feasibility.